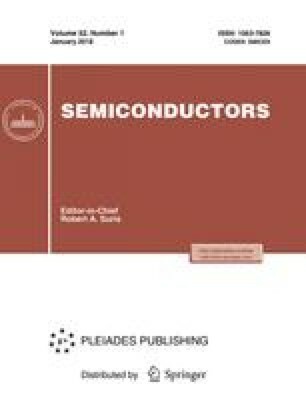 Characteristics of ohmic InGaAs contacts in planar diodes based on semiconductor superlattices with a small-area active region (1–10 µm2) are studied. The diodes were formed on the basis of short (18 or 30 periods) heavily doped (1018 cm−3) GaAs/AlAs superlattices with a miniband width of 24.4 meV. The reduced resistance of the ohmic contact was equal to 2×10−7 Ω cm2 at room temperature. It is shown that the properties of fabricated planar diodes make it possible to use these diodes later on in semiconductor devices that operate in the terahertz frequency region in a wide temperature range (4–300 K). Translated from Fizika i Tekhnika Poluprovodnikov, Vol. 38, No. 9, 2004, pp. 1141–1146. Original Russian Text Copyright © 2004 by Pavel’ev, Demarina, Koshurinov, Vasil’ev, Semenova, Zhukov, Ustinov.